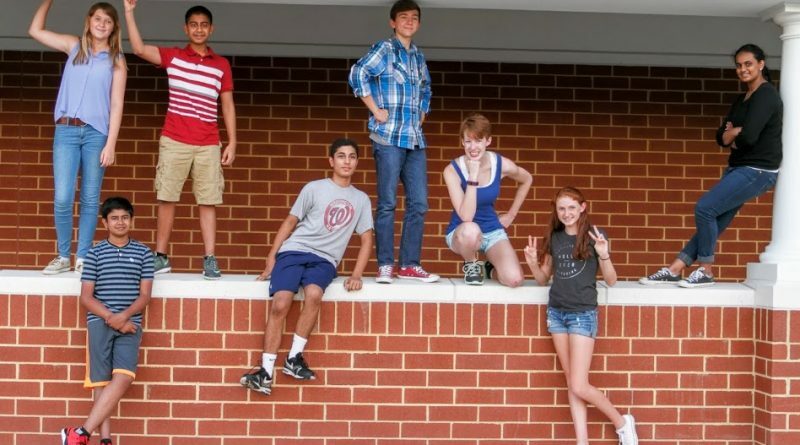 The students who created the Floodie are Rahul Busayavalasa, Caroline Maloney, Rohan Arora, Prasan Chari, Connor Patterson, Samantha Steadman, Grace Maloney, and Satya Paruchuri. What started as a fun project for a group of Loudoun middle schoolers has developed into a patented invention designed to save the lives of flood victims. Earlier this month, eight students received a letter from the Patent and Trademark Office officially declaring their invention, dubbed the Floodie, patented. It was the culmination of a years-long effort to guarantee the manufacturing rights for their unique take on a life jacket. The eight young inventors met through a FIRST Robotics club three years ago. As part of the club’s annual competition, the students were tasked with coming up with a solution that would aid in the response to natural disasters. 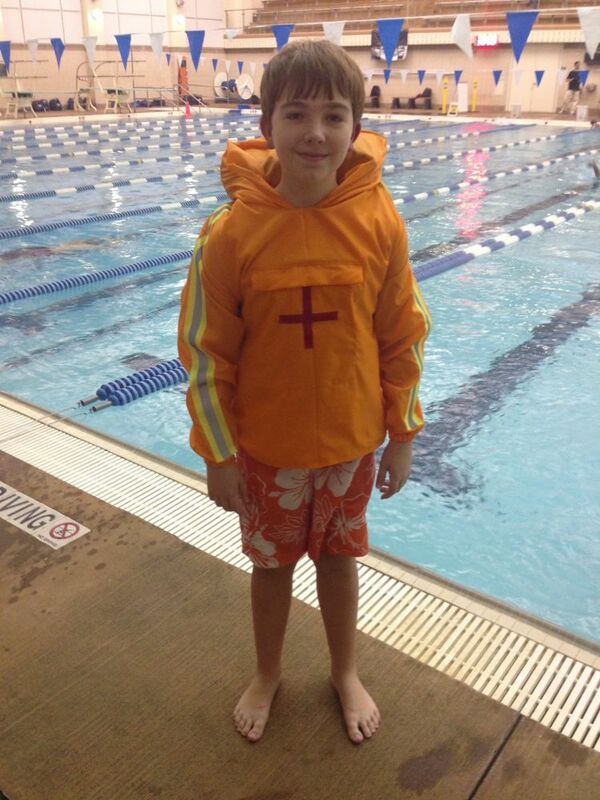 In a 2013 photo, Connor Patterson, one of the inventors of the Floodie, wears the prototype he sewed. “We decided on floods because there had been a lot of floods recently,” said Samantha Steadman, a sophomore at the Academy of Science and Freedom High School. In 2013, flooding hit parts of Colorado, Haiti and the Philippines particularly hard. That year, floods worldwide accounted for 44 percent of deaths caused by natural disaster—more than any other natural disaster, according to World Disasters Report. The students talked about what might save lives during flash floods and thought more people might keep on hand—and wear—a less cumbersome life jacket. The Floodie, when deflated, looks and feels like a hooded sweatshirt. But when it is under water for more than 3 seconds, it self-inflates. The Floodie also includes reflective stripes and a GPS chip that can communicate a victim’s location to search and rescue teams. It is also retrofitted with a provisional pouch, stocked with a Clif bar, Meal Ready-to-Eat, foil blanket, flashlight and water. Rohan Arora, a sophomore at Thomas Jefferson High School for Science and Technology, said the final product reflects how well the team members worked together. Each student brought something to the table, whether it was coming up with the self-inflating concept or researching what should go into the provisional pouch. One student, Connor Patterson, even learned to sew so he could create the prototype. “Without each person, we wouldn’t have been able to create this invention,” Rohan said. The students also offered a big thanks to Oblon, an intellectual property firm that took on the students’ case pro bono to get the Floodie patented. Now the students are talking about the possibilities of manufacturing the Floodie. Rahul Busayavalasa, a Freedom High School sophomore, said they don’t have the capital to mass produce their invention, but they would be interested in leasing the rights for someone else to manufacture it. Otherwise, they are considering picking up their project again after they graduate high school. Busayavalasa, for one, wants to get at least a couple of business classes under his belt first. “I’m in the first semester of my first business class, AP economics, so I think I’ll learn a lot there,” he said.